It's that time of year again – summertime. Usually that means hot vacation spots and adventures. Here at SysAid we want to make sure you have a stress-free summer, and so we present you here in this newsletter a number of fundamental tips, including the one about using the new Password Services. With your end users coming and going on their personal vacations, you don't want to be bogged down with tedious work of resetting passwords, when they can easily do it themselves! Despite that many of us will have some time off this summer, the IT departments in the education industry are busy working to make sure the new school year starts off without any glitches. For them, we offer SysAid's specially-designed Education Edition. Check into it, and be sure to give your educational institution the chance to work in an optimal IT environment. 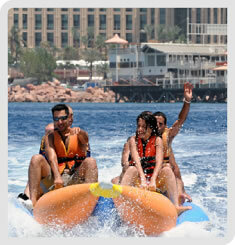 Hope you enjoy the small peek into SysAid's start-of-summer Eilat weekend. Best wishes for a wonderful, relaxing summer! SysAid's employee of the year, Joseph Zargari, shares 5 tips that answer the most frequently asked questions about our new release 8.0, to help you accomplish your day-to-day tasks far more efficiently. SysAid Starts off the Hot Summer Months with a Bang! Have plans yet for summer vacation? A couple of weeks ago, all of us at SysAid with our significant others, travelled to the resort city of Eilat for a little rest and relaxation. It was a fantastic weekend packed with pools, beaches, boats, snorkeling, parasailing, friends, food and alcohol! With just two months until the next school year begins, take the time now to discover how SysAid's Education Edition can serve the diverse needs of your institution with web-based help desk software specially designed for a school IT environment. With the hugely successful June session of the Certification Program behind us, registration is now open for the next session beginning Sept. 1st. Providing an in-depth exploration of SysAid's functionalities and capabilities, in 8 two-hour meetings, this course will teach you best practices and help improve your IT performance. Have you ever celebrated System Administrator Appreciation Day? > Vote and let us know!